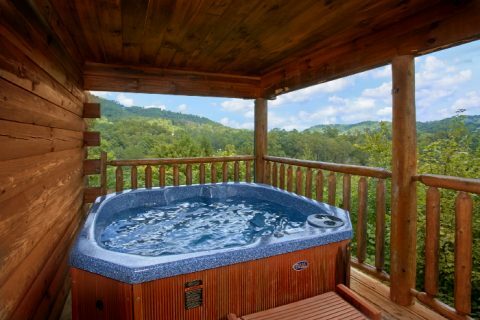 Stay only minutes away from Dollywood and Pigeon Forge when you book "Peek A View"! 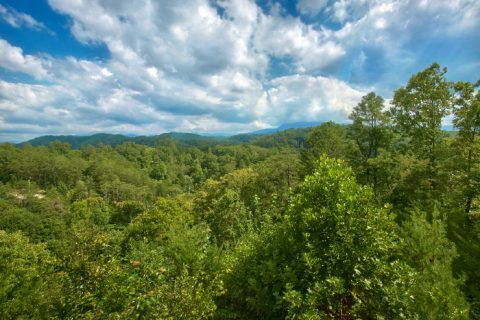 As a one bedroom cabin, this rental is perfect for sharing a Smoky Mountain vacation with someone special. Better yet, you'll enjoy convenience to top nearby destinations. 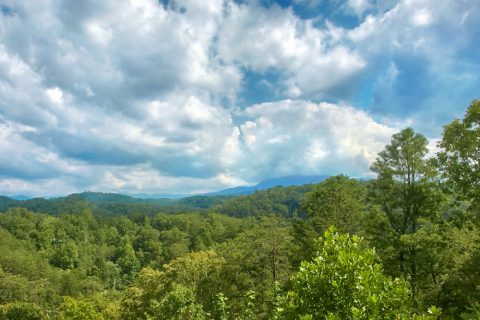 Dollywood Theme Park rests only 2 miles away and the Pigeon Forge Parkway is only 3 miles away from your comfortable cabin with a mountain view! This ensures you can spend long days exploring local sights and then enjoy a short trip to your rental to relax just the way you like! 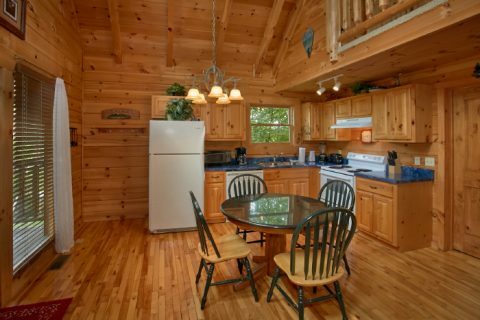 When you step inside your romantic log cabin, you'll notice the open living room area with rustic mountain décor. This space comes complete with a television, comfortable furniture, and a stone gas fireplace. You'll love this cabin's stylish decorations and authentic log cabin interior. The nearby kitchen and dining area are fully equipped for enjoying delicious dinners at home. Additionally, your rental features a charcoal grill on the front porch for cooking tasty steaks. From the main level of your cabin, you can access the covered back deck. 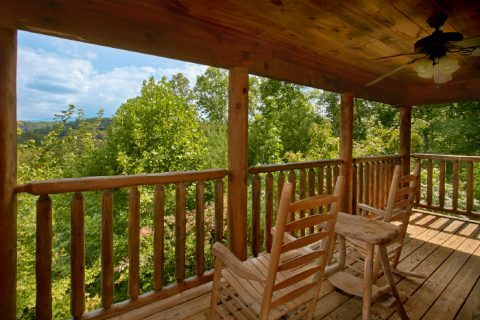 This area is surrounded by trees and offers a secluded spot for resting on your vacation whether you're sitting in a rocking chair or soaking in the hot tub. 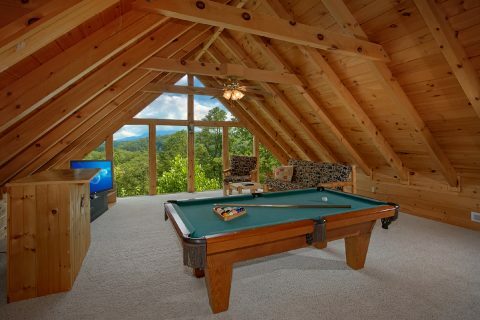 For some great in-cabin entertainment, head up to the loft to play a round of billiards or watch your favorite movie on a 52" HDTV! 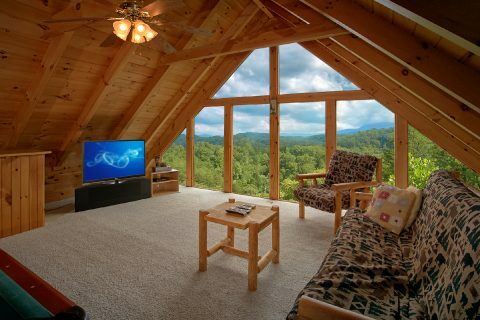 This room also includes picture windows and a beautiful mountain view. 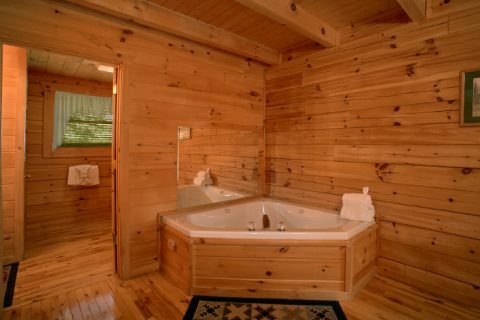 When you're ready to get a great night's rest, retire to the master bedroom with a king-size log bed, in-room jacuzzi tub, and full bath. Enjoy romantic evenings and relax by watching your favorite shows before bed. 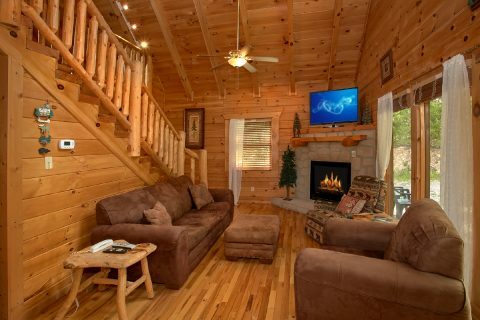 Whether you're planning a honeymoon, a romantic weekend, or just an affordable family getaway, this cozy cabin with a mountain view is a great fit for your vacation! 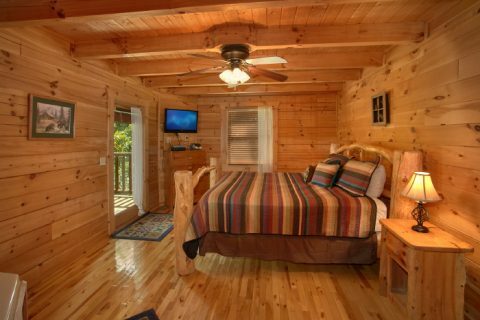 Book this cabin near Dollywood with Cabins USA today and save 15% with our special discount!